The color of galaxies generally comes from its stars. That makes sense: it’s where the galaxy’s light originates, after all. Galaxies with a lot of young stars will be bluish, while galaxies dominated by older stars will shade toward red. I hedge because we’re seeing an average: by and large, galaxies aren’t going to be strongly colored. As a result, the Green Pea galaxies came as a surprise. These galaxies are small (hence the name) and green in color, which is all the more odd because stars are never green to our eyes. (Green Peas are not the first botanical name in astronomy. Lenticular galaxies are “lentil-shaped”, which is also why lenses are named as they are. It’s good to bean astronomer.) When astronomers see green, it’s usually due to light emitted by oxygen atoms in nebulas, but it had never been seen on such a large scale before. Green Pea galaxies were discovered by citizen scientists working with the GalaxyZoo project. GalaxyZoo is an ongoing collaborative effort to sift through Sloan Digital Sky Survey (SDSS) and Hubble Space Telescope (HST) data to classify galaxies according to their shape and other properties. As Alice Shepherd described on the GalaxyZoo blog, the people who first spotted the Green Peas were puzzled: they didn’t really fit into any neat categories. The strong oxygen emission required to make them appear so green meant they were pumping out a lot of very energetic light, which points to aggressive star formation. However, they were definitely galaxies, not something in the Milky Way. 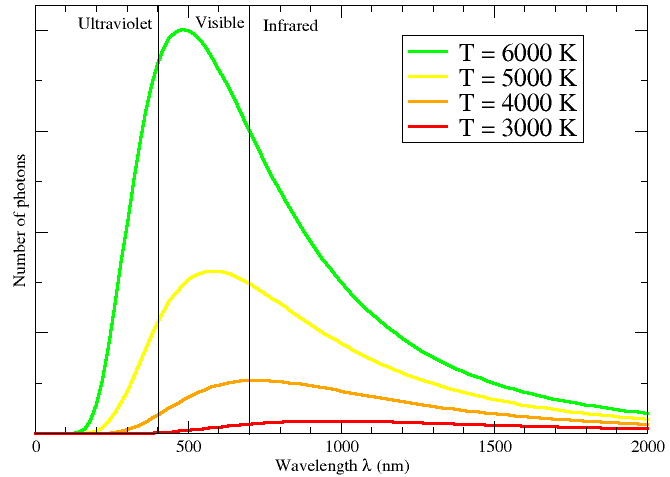 The apparent color of a star is determined by its surface temperature, which in turn is a product of the star’s mass and where it is in its life cycle. Low mass stars are red, very high mass stars are blue, but in the middle…we get white, yellow, and orange, but no green. (For more on star colors and how they are classified, see my earlier post “Oh be a fine girl, kiss me, less tongue, yo“.) How humans perceive the color of stars is as much a matter of physiology and psychology as astrophysics, but we see a mixture of colors. Stars mostly appear white to our eyes, with a tinge of red, blue, or other hues, because they emit across the entire visible light spectrum. In fact, the Sun isn’t really yellow, or else white surfaces would show a yellow tinge. However, colors don’t just come from surface temperature. For gases or solids, they also can be the result of emission or absorption by atoms or ions: atoms with one or more missing electrons. (“Ion” can also denote atoms with extra electrons, but those aren’t common in astronomy.) Each type of atom or ion has its own unique spectrum, as described by quantum mechanics, so astronomers can identify the chemical composition of gas clouds in distant galaxies—even if the cloud itself can’t be seen through a telescope. Most atoms in the Universe are hydrogen, and most of the remainder are helium. The most common (visible light) color we see emitted by hydrogen is red, for example. Of the heavier elements, oxygen and carbon are common enough to show up on occasion, especially in the form of molecules. Many of these molecules we see through their absorption rather than emission, at least in visible wavelengths. Green Peas must therefore be pretty extreme environments, bursting with star formation. As a matter of fact, they have roughly three times the star formation rate the Milky Way has, in a galaxy with less than 1 percent the mass! Newborn stars produce a lot of ultraviolet radiation. If some of those stars are really massive, they live short lives before exploding as supernovas—another source of ionizing radiation. The green light is a sign of Hulk-like powers of smashing atoms. Here’s where things get fun: if the Green Pea galaxies allow enough of that ionizing radiation out into intergalactic space, and if these galaxies are of the same type as some we see in the early Universe, then they might be the solution to a cosmological conundrum. After the Universe became transparent, forming the first stable atoms, something reionized the gas, undoing the work and stripping electrons back off nuclei. Most cosmologists are pretty sure aggressive stars in young galaxies had something to do with reionization, but demonstrating that is another challenge, since those galaxies are very distant and—if the Green Peas are any guide—pretty small. I wrote about the possible connection between Green Peas and reionization for Ars Technica this week. The story isn’t done yet, of course: we need more data on both the Green Peas and the early galaxies they might resemble. However, I love the idea that citizen scientists discovered a galaxy type we didn’t know about before, and would love even more if that type could solve one of the mysteries of modern cosmology.